Apr. 4, 2019 Please Join us for an amazing Double Bill! When Sasha Lurje and Ilya Shneyveys perform with their Yiddish psychedelic rock band Forshpil you’re up for a a powerful sonic explosion far from the theatric nostalgia one could associate with Yiddish song. But when they perform as a duo, old Yiddish love ballads come alive in an intimate and touching setting (yet no less cutting edge then the rock band). The songs, though a 100 (and more) years old, deal with the same problems as today – love, hate, heartbreak, sacrifice, long-distance relationships and mention things like (in no particular order) adultery, wedding, deadly curses, bachelor parties, beer, army draft, rivers, diamonds, gold, silver, musicians, shoes, doves, devil, angels and fish to name a few. The deep and sometimes tragic lyrics of these songs are echoed by the intensity and drama of the performance. Traditional style of singing blends perfectly with the accompaniment of modern instruments, harmonies, rhythms and effects creating impressive soundscapes that engage international audiences young and old, Yiddish-speaking and not. Sasha Lurje was born in Riga, Latvia, and has been singing since she was three years old. She has gained experience with many groups and in various styles including classical and folk singing, jazz, rock, and pop. Parallel to her singing career she has also been involved in several theater groups where she focused on musical and improvised theater. Since 2003 she has been researching traditional Yiddish singing style and repertoire, investigating secular and religious vocal materials. With her band Forshpil, she is developing a new style of Yiddish music by integrating the traditional sound into modern context. Sasha is involved in a number of international projects varying in repertoire and styles. 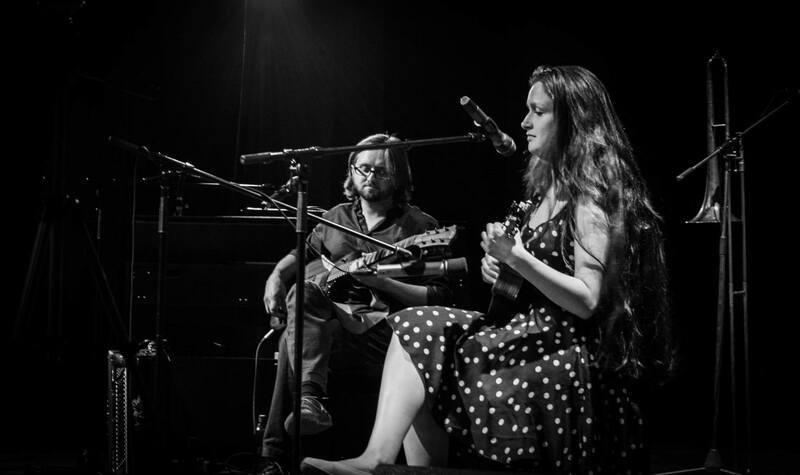 She has collaborated with Daniel Kahn to develop an “interlingual” love song duo program STRANGELOVESONGS. She is also a member of an all-star band Semer Ensemble led by Alan Bern. The group reinterprets Jewish music recorded in Berlin in the 30s and is esteemed for the variety of styles and genres tied together in an artistic and musical way. Sasha also performs and leads Yiddish dance with the Berlin klezmer band You Shouldn’t Know From It. One of her most recent projects is Goyfriend: a collaboration with Brooklyn-based Band Litvakus discovering the musical interactions between Jews and their non-Jewish neighbors. Sasha conducts her research in traditional voice techniques and voice production. And has presented her work at various conferences. Sasha is a co-founder of Berlin Yiddish music festival Shtetl Neukölln. Sasha has performed and taught Yiddish singing in Russia, Europe and North and South America and has been a longstanding artist and faculty member at Yiddish Summer Weimar, where she coordinates the Song workshop. Ilya Shneyveys is an international performer, accordionist and multi-instrumentalist, teacher, composer, arranger and producer of contemporary Jewish music, from klezmer and Yiddish folk song to fusion and experimental projects. A founding member of Berlin’s famous Neukölln Klezmer Sessions and Shtetl Neukölln festival, as well as a long-time faculty member at Yiddish Summer Weimar, Ilya has performed and taught at major Jewish festivals around the world, including Yiddish Fest Moscow, Yiddish New York, Klezfest St.Petersburg, Klezfest London, KlezKanada, Montreal Jewish Festival, Toronto Ashkenaz Festival, Krakow Jewish Festival and more. He is the artistic director and a founding member of the Yiddish psychedelic rock band Forshpil (LV-RU-DE) and a founding member of the Yiddish-Bavarian fusion project Alpen Klezmer (DE), winner of 2014 RUTH World Music Award at TFF Rudolstadt. He is an artictic director of the German-Israeli student exchange project The Caravan Orchestra, for which he was awarded the 2017 Shimon-Peres-Prize. As a touring member of the klezmer-balkan band Dobranotch (RU) he has received the Eiserne Eversteiner Preis in 2017. He has performed and collaborated with such projects like Opa! (RU), The Klezmatics (US), Daniel Kahn and the Painted Bird (DE) and many others. Ilya composes contemporary traditional klezmer pieces and creates original arrangements of traditional Jewish music. He is renowned as an improviser, accompanist and band leader. Originally from Riga, Latvia, Ilya has been traveling the world for the last 15 years promoting Yiddish music and culture. He is currently based in Brooklyn, NY. 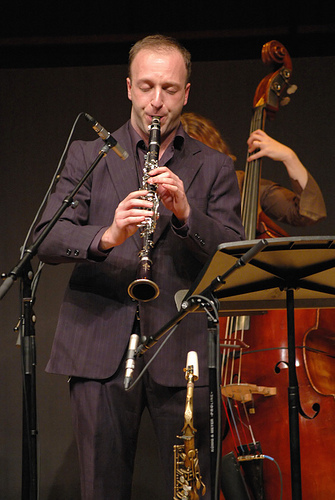 Alex Kontorovich is one of the top klezmer clarinetists in the world, although his day job (as an tenure track professor of mathematics at Rutgers) keeps him limited in his music work. A founder of the Klez Dispensers, he has also recorded and produced two CDs of the music of German Goldenshteyn (one of which is the only CD Goldenshteyn ever recorded), and a CD of original music entitled “Deep Minor.” Kontorovich has performed and recorded all over the world with such artists at The Klezmatics, Beyond the Pale, Fyvush Finkel, King Django, Boban Markovic’, Frank London’s Klezmer Brass All-Stars, Aaron Alexander’s Midrash Mish Mosh, and many others. He was on staff for years at Living Traditions “Klez Kamp”, at Klez Kanada, and at Yiddish Summer Weimar.